Stage fright is unbelievably common, but in most cases, you can hardly tell because the actors have learned to master the art of confidence in the face of stage fright. At the New York Acting School for Film and Television, it's an acting block we deal with and see all the time. Luckily, through classes and coaching, it's a block that can be overcome. In order to talk, you have to be calm and breathe diaphragmatically. Diaphragmatic breathing allows more oxygen to come to the brain and for the blood to circulate more slowly, resulting in a naturally more calm state. This isn't a natural skill and will need to be developed with practice. If you're a trained vocalist, this will come more naturally to you. But with everyone else, it's an important skill to master. Remember, the audience isn't hear for you. They are here to see a performance that has nothing to do with you. Today, you happen to be part of the performance. Your focus should be on your material, performance and the audience's reaction to it, because your task is to inform or persuade them. You therefore want to be aware of how they are responding, so that you can connect with them in various ways. Where you don't want your focus to be is on yourself and your anxiety. This is why it's so useful to develop an accepting attitude toward the anxiety, to take a few steps to calm yourself a little, and then shift your focus to the task at hand. 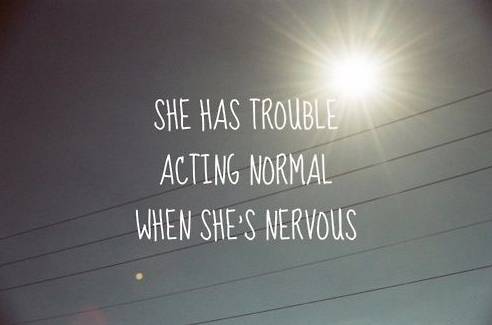 Actor's anxiety and stage fright can easily be overcome with the right training and practice. Don't be discouraged. The New York Acting School for Film and Television is ready to get you through it and on your way to success.